1. 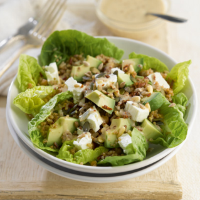 Scatter the lettuce leaves over a large plate and top with the quinoa mix. 2. Add the cheese, avocado and salad topper. Drizzle with the dressing and serve.